Watch your blues melt away with this vivid statement Blue Montana Necklace. 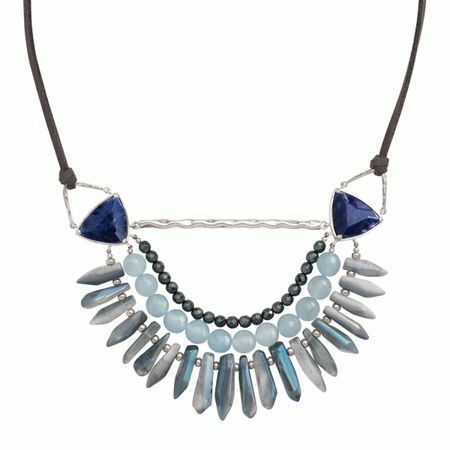 Large blue strands of natural hematite, quartzite, rock crystal and sodalite adorn this beautiful piece, making it a perfect match for neutral dresses and shirts. Pair this necklace with the matching Blue Montana Stretch Bracelet to add even more blue hues to your ensemble. Feature piece measures 2 3/4 by 4 3/16 inches. Necklace measures 18 inches long, plus a 2 inch extender for adjustable length, and features a lobster clasp.